The only difference between the KU6290 and the KU6300 above it in the Samsung lineup is that the KU6300 has the Smart Remote, and the KU6290 has a standard remote control. 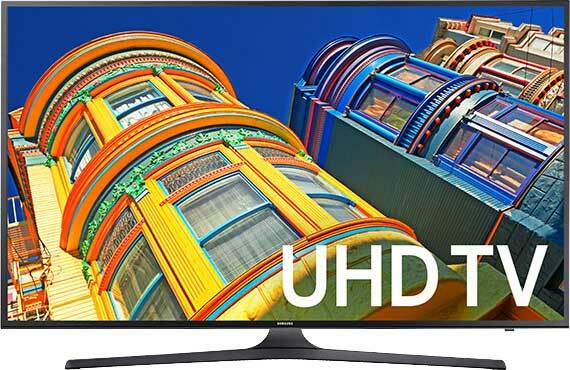 The KU6290 4K LED TV from Samsung is best priced 4K offerings from Samsung but still has ample some good features like Smart TV offerings, UHD Picture Dimming, a quad core processor, HEVC 4K streaming decoding, and a contrast enhancer. Though the 6300 has 4K UHD resolution, it rivals 1080p TVs of the same size from a year or two ago in price, one of its best features. "Samsung's Semi clear coat screen on the KU6300 allows rich, accurate color"
As we've mentioned many times before, edge lit LED backlit LCDs are not the ideal picture technology (even in 4K), however Samsung's semi clear coat screen is a big plus. Images are clear and color information is accurate. Over time, some light bleed is likely to occur – noticeable during very dark or black background scenes. Colors pop very well for an LED TV and Samsung has the brightest LEDs (peak Whites) in the industry if you need a very bright screen. The clear panel technology in this screen which helps to absorb ambient light is an excellent feature. Generally, with scaling you get what you pay for. This is an area of great differentiation among 4K TVs. Some of the more expensive ones will have much better scalers. But, the KU6290 does a reasonably good job for the price point. Scaling is exceptionally important since most of the TV we watch these days is streaming from Amazon, Netflix, HBO...or 720p cable. A TV's upscaling will never be able to make as much difference as the original signal source, but it can create cleaner, sharper image edges in the best case. The KU6290 does a good job presenting streaming and 720p signals. The scaler is not of the cheaper variety. This 4K TV will not look better than a very good 1080p TV with standard and HD signals, but wait!, there are no more very good 1080p TVs. The manufacturers stopped making them. While not the most robust scaler, the KU6290 gets a good score for the price of the TV. Color saturation and contrast do fade when viewing from off center though much more subtly than I expected. In fact, the untrained eye will likely not see much difference in contrast saturation until around 15 degrees off center. Early models of the 4K TVs from Samsung did not look this good from the side and were more in line with standard HD LED TVs. Don't get me wrong, it's still a drawback, but not as pronounced as it once was. This was probably the single biggest drawback compared to OLED aside from the deeper blacks and richer colors on OLEDs. The KU6290 employs Samsung's new Purcolor which is the lowest color gamut spec they offer for 2016/2017 and the differentiating spec between the KU290 and the KU7000 above it (with active crystal color). 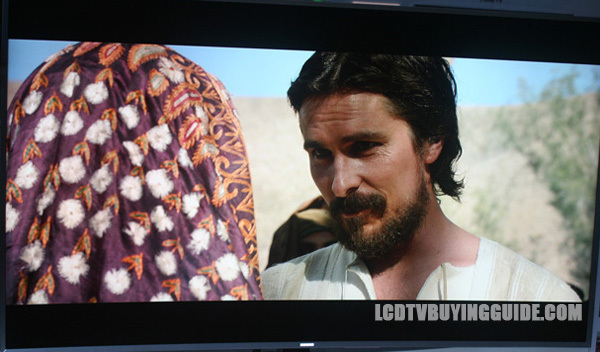 One thing we like about this TV though is color accuracy and ease of calibration to get a very passable picture. Click here for the calibrated picture settings. The native panel refresh rate is only 60Hz for the KU6290 so you will see some judder on those movie scenes with side to side panning. The backlight manipulated Motion Rate is 120. This is another compromise for a lower priced TV. This is not to be confused with fast action sports performance. Motion blur from sports is actually negligible if non-existent. It's 24p material, movies where you will likely notice the judder the most. You can always add the Telenovela effect by using the Auto Motion Plus feature and get rid of some or all of the judder. The KU6290 does not get the top Samsung Tizen OS Smart Hub of the top models, but instead gets a similar Smart Hub suite to last year with the same basic design. Samsung hit the mark with their user interface and intuitive navigation. This time around you will see the Game tab as one of the major smart TV pages. The On TV page allows for individual logins. This means different members of the family can have different recommendation settings. This is a big plus for a home with multiple TV users. The Smart Hub for the KU6300 includes a full web browser. The KU6290 has a nice design with a half inch border charcoal black matte frame surrounding the screen. The screen is 2.5” in depth so plenty thin for wall mounting. It's no knockout design, but I like thee lines of the new stand. It's also very sturdy while looking updated and modern. The KU6290 has a standard remote control with a 5-way controller for Smart TV controls. There is plenty of volume from the inbuilt 10w speakers. It's not what I would call high quality defined audio, but it gets the job done. The KU6290 is DirecTV ready for 4K content. The TV has built in Wifi, and plenty of HDMI inputs (4) and 3 USB inputs. It also has mobile to TV mirroring and a Game Picture Mode for gamers. Though we were not able to test the HDR Premium picture, it's nice to have some future proofing HDR compatibility included. This just means that it will be able to display some types of HDR content on the screen, even though the TV does not have a wide enough color gamut to capture all the nuances of HDR. There is a Game Mode for gamers. This is a good gaming TV with around 28ms input lag when Game Mode is enabled. The UHD Dimming feature really does not quality as local dimming and does little to enhance contrast in various areas of the screen. The feature tends to darken the screen and is not a preferred feature to use. 3D is not included. 120Hz panel is not included. Even though the KU6290 has HDR compatibility, it does not have a very wide color gamut for enjoying the best benefits of HDR. Even though the KU6290 does a good job of up-conversion, it does not have a high end scaler. The KU6290 includes a scaled down version of Samsung's Smart Hub rather than the top of the line Tizen OS. As the lowest price Samsung 4K TV this year, value is an important aspect of this TVs appeal. The only feature dropped from the KU6300 above it is the Smart remote control. With the 65KU6290 you save $150 for taking the standard remote, which is a great deal. Pricing is very appealing. UN65KU6290 - $1249Drop the Smart remote for a standard remote with the KU6290 and you save $150. What a deal on a 65 inch TV. UN55KU6290 – At $789Less of a discount to the KU6300 for taking the standard remote. A great deal though for a 55 inch TV with these features. TV without stand: 65” Model 57.6" x 33.2" x 2.5"
TV with stand: 65” Model 57.6" x 35.7" x 14.5"
48" 1080p LED Now $479! 55" 4K Smart TV $999!